When you’ve invested heavily in a new camera, whether serious point-and-shoot or DSLR, the next thing you must do is invest in a suitable carrying case. Experience has proven, unprotected cameras sitting on a car seat will inevitably go crashing to the floor, the first time someone cuts you off in traffic. Having a really protective bag is your best insurance. Brenthaven bags offer great protection with their 100% lifetime guaranteed BX2 Extreme Foam protection that actually distributes the load upon impact. Reputedly the foam absorbs 90% of the energy of impact, while maintaining its shape for the life of the product. I recently tested the BX2 Backpack model (UPC 7 30791 17031 5) and was favorably impressed. The exterior is a smooth charcoal grey material with an abrasion resistant material on the bottom. The top accessed zipper compartment is big enough for chargers, batteries, memory cards plus a sandwich (preferably in a zip-lock Baggie.) There are also slots here for business cards, your phone and pens/pencils. The lower section has enough dividers to handle most every lens you probably own. My Nikon D300S DSLR with my “go-to” 18-270 zoom fits nicely in the t-shaped divider. I can also remove an interior divider and it will handle my D2X with Nikon 70-200 f2.8. All the dividers are adjustable so you can carry a combination of small lenses and maybe a large, external strobe. 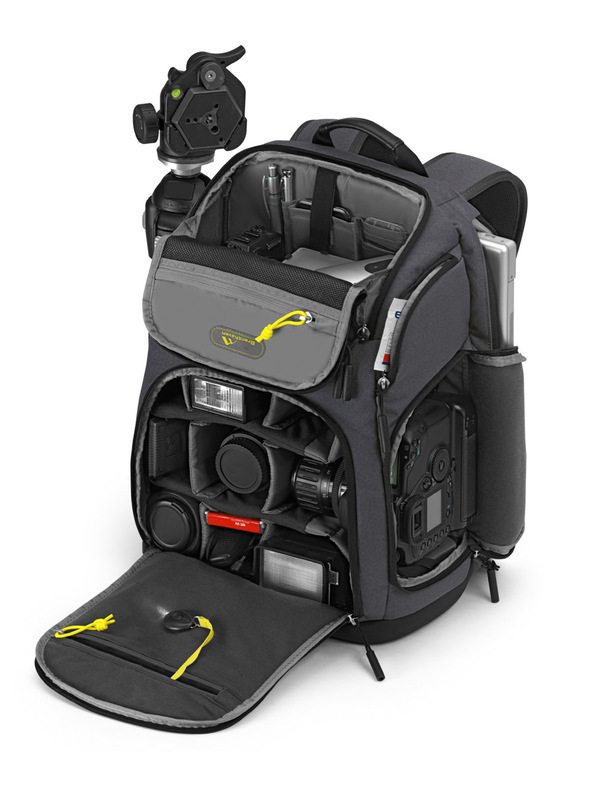 Two zipped openings let you access the camera from side or front of the bag. Shoulder straps are comfortable and come with an adjustable sternum strap. There’s a really useful strap and support for your tripod on the side. This was one of my favorite features, as I’m always amazed that camera backpack manufacturers usually fail to include this feature. I can even carry my not-really-lightweight Benro tripod with medium-sized ball-head. The side zipper opens to allow carrying a laptop up to 15.4”. An additional exterior pocket is ideal for memory cards. A zipped pocket on the upper section is great for notebook and pen, should you be one of those who still like to write in the analog world. An interior zipper pocket in the lower camera section includes a lanyard for your keys with a small penlight included. A rain cover is also provided and stored in this pocket. Before you buy a new camera bag, check out the Brenthaven Camera Collection at http://brenthaven.com. They come with a 100% lifetime guarantee.